Which is exactly what FBD Holdings (FBD:ID, FBH:LN) delivers, while offering a longer & arguably better track record than those feted companies. Let’s begin with a proper introduction: FBD was founded in the ’60s by a group of Irish farmers, and is now one of Ireland’s largest P&C insurers, with a loyal client base of farmers, individuals & small business owners. It’s the only Irish owned company left in the sector, since Liberty Mutual bought control of Quinn Insurance. The company experienced a changing of the guard in 2008, with Andrew Langford appointed CEO (now a 16 yr company veteran, despite the youthful appearance) & Cathal O’Caoimh as Group Finance Director. Director’s annual comp. is EUR 2.1 mio, which appears to be less than the value of their share/option holdings (and the CEO’s been buying shares). The original/founding company, Farmer Business Developments plc, is a long term/core shareholder with a 25.5% stake in FBD’s ordinary shares. Outstanding shares total 33.4 mio (ignore 13.2 mio of ‘A‘ ordinary shares, they’re non-voting & have no capital or profit participation rights), for a pretty decent market cap of EUR 344 mio ($446 mio). – We’re now in a fifth year of economic contraction – how much worse do you think it can get?! – The ISEQ stock index collapsed 82%, and is still down 69% today – again, how much worse do you think it can get?! – Irish property prices have fallen by 50% to almost 70% – again, how much worse do you think it can get?! FBD Holdings really is…Ireland Inc! Now, bearing all that in mind, what’s your prediction of how FBD would end up 5 yrs later in 2012? Does it look anything like this..? Yep, I thought not..! Don’t worry, I’m sure I wouldn’t have predicted it either. If the company can deliver superb defensive play like that, in the face of an economic meltdown, the future should hold no qualms for any FBD investor. The explanation lies in their underwriting record. [We may need some context: If I recall, the global industry generally averages ’round a Combined Operating Ratio (COR) of 100-102%. Yes, it actually breaks even/makes losses on its core underwriting business! It only turns a profit if investment earnings on its ‘float‘ exceed the (cheap) 0-2% cost of the related claim liabilities (presuming that 100-102% COR). Of course, any fan of Buffett already knows this (btw, don’t worry, we’ll be ignoring more exotic ratios – if you’re happy with a company’s balance sheet, long term underwriting record & valuation, you’re pretty much done!). The delight over cheap float obscures another key advantage: Leverage. The spread (investment earnings vs. float cost) is v positively impacted by the inherent leverage of an insurance company. COR blimey, mate! FBD has sustained an avg. COR of less than 86%, over a decade. This is also confirmed by a history of positive runoffs for a decade now. This arms the company with an exceptional advantage. Think it’s a fluke? Here’s another perspective, Return on Equity, that’s even more impressive. This balance sheet de-risking was basically completed with the spin-off of most of FBD’s remaining property/leisure assets into a JV, and the elimination of all debt, in Aug-2011. The majority of the bond portfolio’s in German bunds, the balance in short-dated Irish Treasury Bills (no longer dated Irish bonds), and duration’s kept pretty short. Deposits are spread over an approved selection of large/highly rated US, UK & European (non-PIGS) banks. Irish exposure’s restricted to the largest banks & is government guaranteed – any ending of this guarantee would likely prompt a re-allocation to other approved banks. 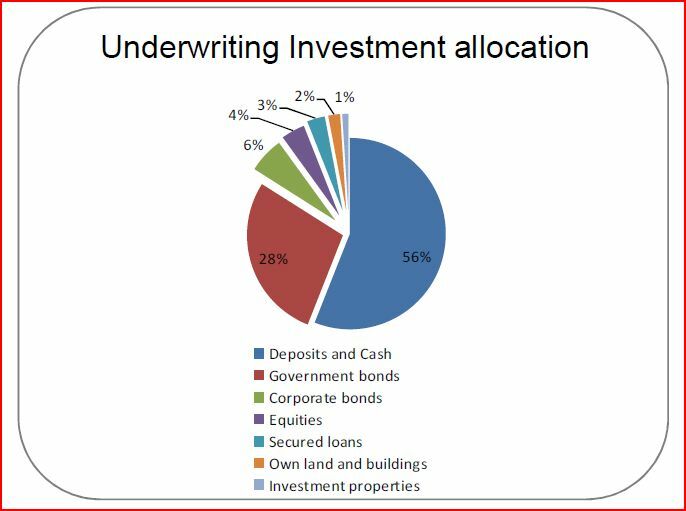 With the recent disposal of a secured loan (for a 4.4 mio gain), 92% of FBD’s investment portfolio is now in deposits, government bonds & investment grade corporate bonds. FBD reported H1 2012 operating earnings of EUR 0.75, and diluted EPS of EUR 0.58. [Operating earnings are based on long term investment returns, while diluted EPS reflects actual returns. FBD’s current portfolio composition & yield should normally produce a predictable shortfall in actual investment earnings, so we’ll sensibly focus on diluted EPS here]. However, this included EUR 3.3 mio of exceptional charges/impairment, which implies a pre-exceptional diluted EPS of EUR 0.664. Last week, FBD confidently increased FY 2012 operating earnings guidance to EUR 1.55-65. Presuming EUR 1.60, that’s a 213% gross-up from H1 – which likely puts FBD on a FY 2012 pre-excep. diluted EPS of EUR 1.417, or a P/E of just 7.3! This allows some wiggle room for possible H2 charges, and I’m sure my estimate will be exceeded by yr-end anyway. This puts FBD on a Price/Book ratio of just 1.43 – for a company with a 22.5% RoE (based on a EUR 1.417 EPS / EUR 6.30 yr-end 2011 NAV)?! An 8-12% RoE’s usually awarded a P/B of 1.0 in the market (for example, banks usually top out around a 20-25% RoE & a corresponding 2.5-3.25 P/B – remember those days?!). I’d argue FBD deserves a premium based on its low-risk balance sheet and long term COR & RoE record – but let’s split the difference, and assign a Fair Value 2.25 P/B ratio. That implies a EUR 16.20 Fair Value per share, which offers an Upside Potential of 57%. What’s perhaps more exciting though is the likely compounding after the current valuation gap‘s potentially closed. 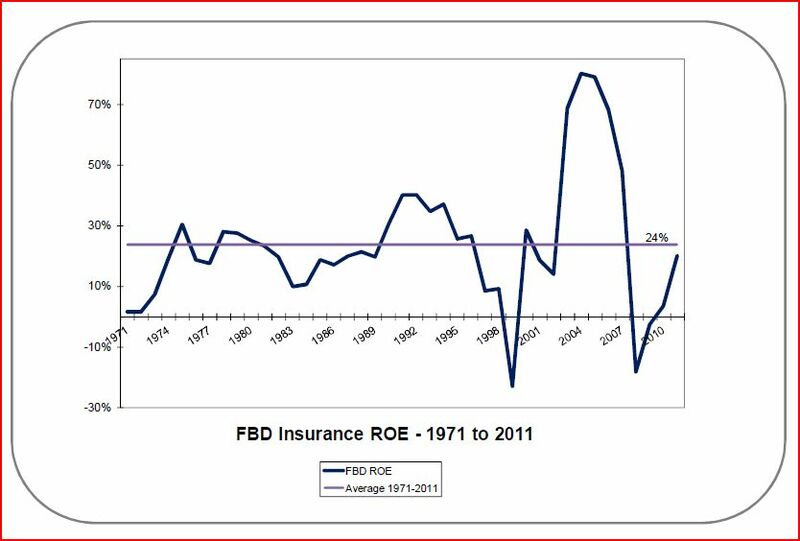 FBD’s long term RoE, and current 12.2% market share, certainly suggests no barrier to growth. In fact, it’s created a broader/multi-channel distribution in the past few years via: a) more sales offices targeting its core farming/rural client base, b) FBD.ie & nononsense.ie which particularly target urban customers, and c) a rapidly expanding broker network targeting business owners. Combine that with a fortress balance sheet, a low average COR, predictable investment earnings, and a high RoE – they have the perfect formula to relentlessly grind down competitors & grind out shareholder returns. If we i) presume a more conservative 15% RoE compounding, and ii) assume FBD ends up on a 2.0 P/B rating (based on reversion towards their current RoE target of 18%), we could see the shares (ignoring dividends) easily reach EUR 28.96 in 5 yrs time – a secondary Upside Potential of 181%. I’m not making that a formal second/fair value target – only a fool anticipates 5 yrs of future growth! But it gives you some idea of the significant/ultimate potential I can see for FBD, even though it’s a stock that lets me sleep soundly at night. Note that type of return is based on tax-exempt dividend reinvestment. Taxes on dividends would reduce returns somewhat, which highlights the superiority of share buybacks. FBD has a decent 3.4% dividend yield, with ample 4 times coverage – the ultimate intention is to perhaps double that payout. But as long as FBD trades below intrinsic value, a regular share buyback (vs. an increased dividend) offers a more tax-efficient return. It would also enhance shareholder value – this may seem counter-intuitive as a buyback (at a premium to NAV) actually reduces NAV. However, it’s easy to calculate it would produce an increased EPS & RoE, which should equate to a higher intrinsic value per share. Some measured reduction in investment assets to fund larger/more opportunistic share buybacks would also be an attractive use of capital. FBD actually trades v technically. Recent support/resistance levels include EUR 8.05, EUR 8.50-60 & EUR 9.20-25. My latest purchase was about a week ago, right down at that EUR 9.25 support, as the share retraced…in the wake of Hurricane Sandy?! Frankly, I expected to see a longer period of consolidation in the 9.00s, but we now appear to have definitively broken EUR 9.60-90. This technically offers potential for FBD to now begin setting new 4 yr highs. It also appears to present clear blue sky for the share to target EUR 12.50, or even EUR 15.75, in due course. FBD’s now a 5.8% portfolio stake for me, a Top 5 holding. The question I have is: how does FBD manage to get such a low COR? What is their advantage? Why can’t their customers get lower rates elsewhere? Is it reasonable to assume that they can maintain this COR when they are growing their business? The secret sauce, eh? Tough question, Hielko! i) Well, logically, there has to be a COR market leader, so it isn’t necessarily a cause for suspicion. 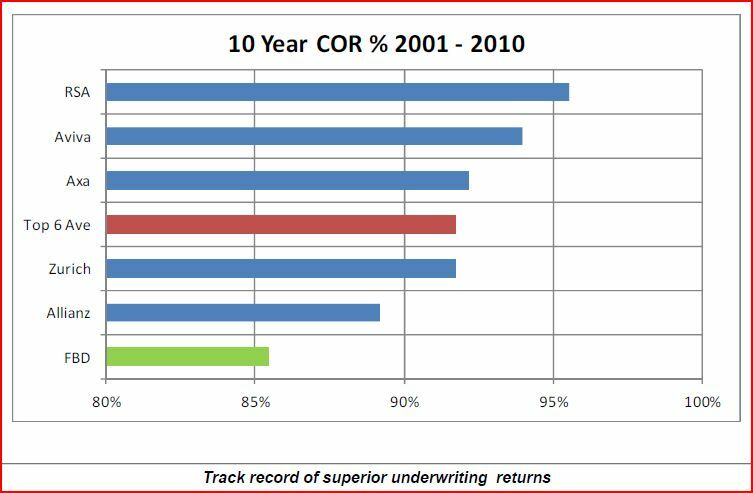 Of course, since it’s insurance, we hv to ask if they’re mis-pricing risk – long-term COR, reserving & RoE record confirms they’re not. ii) OK, this might seem folksy, but I think it’s v relevant: FBD has always reminded me of one of those de-mutualized institutions that retains a prudent approach to risk, an intensely loyal client base, a parsimonious business model, and a roll-up-your-sleeves/let’s get it done attitude. They keep their cost ratio low. Their loss ratio is perhaps assisted by the closeness to their client base – may help weed out frivolous/fraudulent claims? 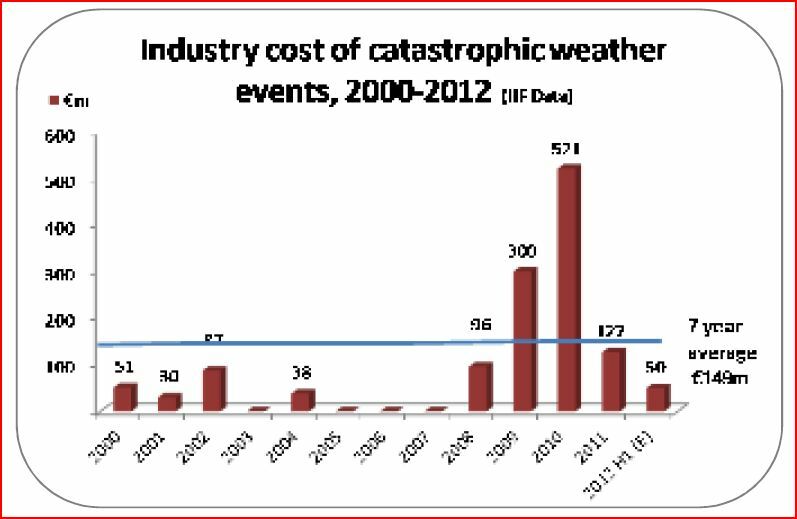 They regularly emphasize they only write sensible business – all insurance co’s say that, but FBD’s record suggests they follow through. I can attest to the loyalty of the client base – maybe customers didn’t get the cheapest deal, on occasion, but FBD’s success & increasing economies of scale hv ultimately rewarded them w/ better pricing. 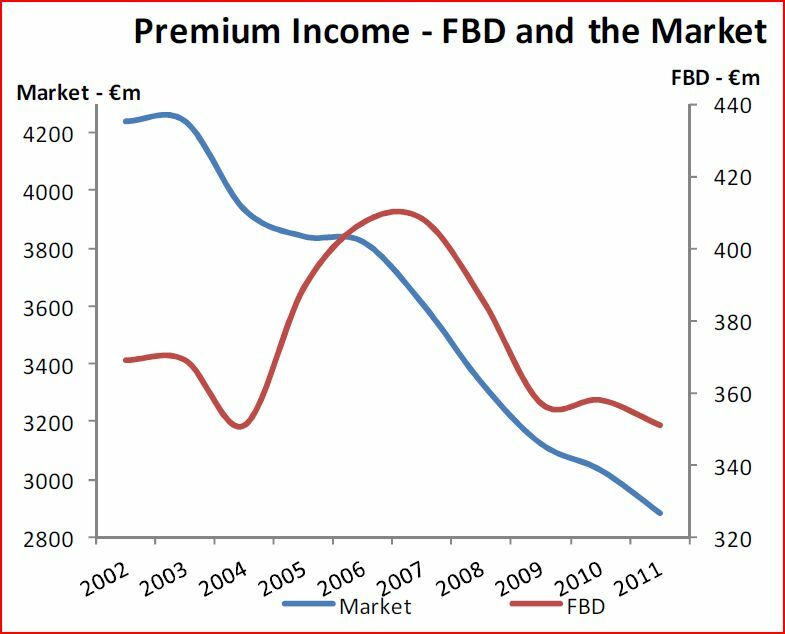 I don’t see a constraint in terms of growth: FBD lives & dies by the Irish economy every day – its competitors are part of much larger groups with foreign perspectives. And tht might be the beauty of it – wht foreign group is picking out Ireland now as a mkt where they plan to undercut everybody (or even enter?!). So even though Ireland’s a tough environment, I believe FBD’s competitive advantage allows them to grow market share & maintain a market-beating COR. From their current 12.2% market share, I think an ultimate share of 15%-even 20% in due course is possible – that wd represent a multi-yr growth runway. Great blog, post excel files – makes it more interesting. It’s a shame: It’s been obvious fr years that a sale of APN (at a vastly higher price!) 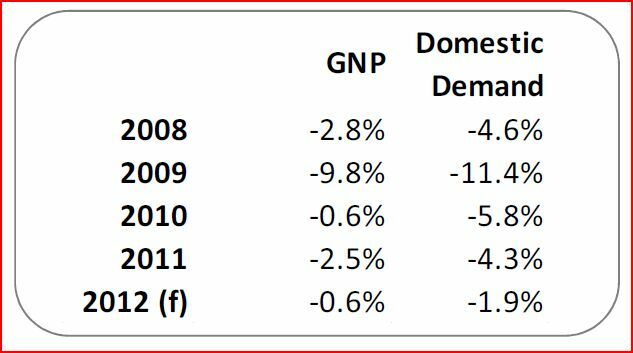 & a paydown of debt might hv helped stabilize INM. I think Denis O’Brien’s ascendancy here sucked in a lot of new investors also. Somewhat understandable – I’ve huge respect for his business acumen – but even smart business people end up involved in media as a vanity project, 9 times out of 10.